This condominium is privately owned by Irons Properties LLC (as will appear on your credit card statement) and professionally managed by Vacation Realty Hawaii LLC 808 822 0272. You are renting directly from the homeowner therefore reservations are not transferable between units. A $500 security deposit is required with this reservation and we may process a credit card authorization in that amount prior to your arrival. A charge may result for damage to the condo, missing contents or for exceeding the stated number of overnight guests. If a guest arrives without notice earlier than the scheduled check in time of 3pm or fails to depart by the required 10am checkout time, their security deposit which is on hold will be charged in full. Our units hold very busy time lines and the failure to leave on time can cost money and schedule disasters. Likewise arriving earlier than scheduled can disrupt the busy cleaning flow, cause mishaps and confusions with the housekeeping staff. Damage in excess of the $500.00 security deposit will additionally be charged to your credit card commensurate with such damage. Guests are responsible for reporting any damages immediately to on-island contact Graeme D. Merrin, RB, ABR, GRI, 808 822 0272 or graeme@graememerrin.com. SUNTAN LOTIONS, AFTER-SUN LOTIONS AND RELATED PRODUCTS LEAVE BLEACH-LIKE STAINS IN FABRICS. PLEASE BE CAREFUL WITH OUR UPHOLSTERY AND BEDSPREADS. We use white towels and white sheets for this reason, but it is not practical to have white sofas and bedspreads. Please shower before getting into bed, and please sit on a towel if you have sun products on your skin and you want to sit on the upholstery. Wash hands thoroughly after applying sun products to avoid accidentally damaging fabrics. Guests are responsible for damage to linens and upholstery from products they use. There is a $25 replacement charge for a ruined towel. The condo was just as described. Plenty of needed extras. Nice location and easy to find. Very peaceful and quiet. The pool/sauna was great. The only utensil not there was a baking sheet. This town house was very nice and comfortable. The only thing that was of concern was that it was warm and the a/c was preset to a temp that was boarderline uncomfortable. Pool area was nice and clean. Would recommend! Thank you for your review for the condo 24c at Nihilani. We do have a new system that helps with the AC system and keeping it covered. It helps monitor if people are running the AC with doors and windows open as well as when the temperature gets to a certain number, it will turn it on and off accordingly. However the low temperature is set to about 68 or 69 so it should not have gotten hot. It really is set to a nice range. The Kauai electric bills are really really quite high and one month can be 600 dollars. We do want the guests to have use of the AC and we do not charge like so many vacation rentals do but the monitoring system helps with guests who do not think about the windows and doors or extreme low temperatures. We are glad you found the condo comfortable and nice and thank you for your recommendations. We booked this with a couple of friends and there was plenty of room. The condo was everything it advertised and more. We had planned on buying snorkeling and beach gear and donate it when were done, but there was gear there to borrow. Location was great for walks any time of day. Great location to attractions and food. The condo had everything we needed! It is very spacious and could easily house a family of 5 or 6, or 3 couples even. It was just my wife and I so we really got to spread out and enjoy the space. It was homey, tastefully decorated and had all the amenities we needed. A nice bonus were the beach chairs, boogie boards, cooler, masks & snorkels, pool noodles and other assorted beach goodies that were in the garage. We put some of it in the trunk of our rental and then just had it whenever we stopped at a beautiful beach (which was typically more than once/day!). The Princeville community is very nice and the collection of shops and the grocery store is close by and quite handy. Not really walkable to a beach but one really should rent a car to experience all the island has to offer anyway! Thanks for the great stay! This condo was wonderful. We had a fantastic time and the condo was perfect. We had one issue with the dishwasher leaking aloha condos sent someone out right away to take care of the problem. I would love to stay in this unit again on our next visit. It suited our family perfectly! Thank you Aloha Condos! We had a nice stay in 24c and overall it's a very nice place. The carpet is very filthy and wrinkled, but other than that, the condo is as represented in the advertising. The main problem we had was that the pool, which is extremely nice, was a main reason for our booking this unit. We were informed long after we booked the condo that the pool would be closed for maintenance for almost our entire stay. We called to voice our displeasure and were promised a discounted rate in exchange for our inconvenience. After I arrived on property and confirmed that the pool would indeed be closed, I called again to inquire about the discount. The company refused to make good on their offer of a discount. Be careful and thorough when dealing with Aloha Condos because they were not entirely honest in our dealings. I will post this review on TripAdvisor, Yelp, and VRBO in one week if we don't receive the discount we were offered. Thank you for your review and letting us know you had a nice stay and it was a nice place. We are sorry that the pool was being renovated during your stay. As you should recall, we spoke with you on the phone before your arrival when you noted in one of our emails the pool renovation. We mentioned that this was last of many notices given you about the pool renovation in multiple emails sent over several months. We also spoke about the highlighted banner posted on the website about the pool renovation before your reservation was made for you to read and decide at that time if you wanted to book. We are very confused as to why you are saying that we had offered you a discount. We did not offer you a discount and you never did ask for one. The conversation with you was about how to get access to a pool somewhere so your family would be happy. Of course guest of this complex cannot use pools in other complexes. If you had asked for a discount, we would not have honored it because we did do our do diligence in this matter. After your departure and this review, we did have the housekeeper inspect the carpet for us in order to determine the state of it. The housekeeper confirmed the carpet was not in need of cleaning. This carpet by the way was only about 1 year old. We did note however that the carpet did need to be stretched and was the reason for what you called wrinkled. We will be working that into our schedules. We had a beautiful time. We loved the condo and the amenities! Princeville is a great location. The only negative was the downstairs neighbor. She left a nasty note on our door. Our first morning there we were having coffee on the lanai just visiting and due to the time difference it was 6:30 am Hawaii time . She yelled at us to basically shut up. We didn’t realize we were speaking loudly so we made a conscious effort to be quieter. That evening we found a note taped to the door . Thank you for your post in response to our request for the unit 24c at Nihilani. We really glad to hear you enjoyed your stay and had a beautiful time. Thank you for mentioning the great condo and the amenities and location. We are sorry to hear about the neighbor. As in any complex there are quiet hours and it usually is before 7 to 8am in the morning. I am sure the sound travels there because an island does not have the hussle bustling noises as in typical areas. It sounds like you might not have had any further comments from her though. It is too bad she could not have been a bit more polite and we are sorry about that. We will bring it to the attention of the on site complex manager. Our family had a great stay at this tremendous condo. With 4 adults and 2 kids we had everything we needed. From a well stocked condo to a garage full of beach stuff there was everything you need. You cannot go wrong booking this condo for your next vacation in Kauai. I know when we go back this place is at the top of the list. We really enjoyed our stay at this suite. It was nice and close to the grocery store and other small shops. There were a bunch of beaches close by too. Would definitely stay again. We stayed at the condo with 6 girls and were pleased to see that all the bedrooms and bathrooms were spacious, nicely furnished and clean. There were plenty if linens. The kitchen was well appointed. In the garage there were plenty of beach toys, chairs and umbrellas as well, which we didn't get a chance to use as we were only there for one night. All in all we couldn't have been happier with the place. Thank you! The condo was beautiful and very spacious. Everything was updated and very clean upon our arrival. We really appreciated having the full sized washer and dryer in the unit. The only improvement suggestion would be to think about keypad entry front door. Thank you for posting a review! We are always happy to hear that our guests are pleased with the units. The lockboxes at the front door for your access seem to work well for us. We do have some units that have the number pad instead of the keys but both seem to be equally sufficient for the guests access. We do hope you can come back again! What a great unit! Very clean and spacious and stocked with every possible amenity needed. We enjoyed the pool and hot tub very much. I would return and recommend to others. Thank you for the great review for the unit 24c at Nihilani. It is a very spacious unit and the pool and hot tub are a great way to relax. We hope you can return and thank you for the recommendations. We recently stayed here with 2 other couples and the house was perfect. Very spacious, comfortable, clean and had everything we needed to feel "at home" The location was close to beautiful beaches, grocery store and places to eat. We would definitly stay here again!thank you! We so appreciate you taking the time to write a review for the unit 24c at Nihilani. We are happy to hear you felt the unit was sjpacious and comforable and clean. The fact that you felt at home is a great complement. We do hope you can come again! This property was Amazing! Clean and stocked! The beds were very comfortable! It was supplied with everything we needed! Chairs, umbrella and some snorkel gear and more. The unit was clean and we loved having so much space with quiet surroundings. It exceeded our expectations!! We so appreciate you taking the time to post a review for the unit 24c at Nihilani. We do take pride in making sure the condos are clean and accommodating. We are always glad to hear the unit exceeded your expectations. The condo itself is beautiful. Very spacious for our family. The place was clean, kitchen well equipped with all utensils needed except a crockpot. Would have loved one of those to have our meal cooking well we spent the day out enjoying the island. Washer worked well, the dryer seemed to take a long time to dry towels. When I looked at the lint trap it looks like a lot of sand was stuck in there from previous tenants. Could use more towels at the condo because you usually shower twice a day if you're at the beach. The pool area is perfect for an evening BBQ which we did! The condo we loved!!! The neighbor below us was horrible. He came to the door our first day there and said he lives below us and can hear everything. He works early in the morning and goes to sleep early. We apologized for being loud when we arrived late the night prior, but carrying luggage and kids up the stairs and the garage door being right next to his bedroom there isn't much of a way to be quiet. We did make sure the kids did not run and jump around and thought we were being very considerate of the man living below. However, the next day while eating on the lanai we could hear the man screaming on the phone to someone about how loud we were, cussing like crazy about how he has to deal with this every week from renters, I'm not sure who he was talking to as were never called from the owner or rental company. But it did scare my kids with his cussing and yelling. After that it made it unenjoyable to be at the condo as we felt we had to whisper and walk softly. Even doing that we heard him still complaining and cussing to someone while we loaded our van in the garage. We met some condo owners at the pool and told them how uncomfortable the man below made us feel. She gave us her contact info because her condo has both upstair and downstairs. We will most likely be renting from her next summer as this man made our visit very unenjoyable. Thank you for posting a review for the unit 24c at Nihilani. We are very happy to hear you found the unit clean, well equipped and the amenities in the complex useful. Each condo is supplied with fresh linens upon arrival but then it is up to the guests to use the convenience of the washer and dryer right in the condos to refresh as wanted. The more efficient applicance do take longer lenghts of time to complete the cycles. We do apologize for the downstairs neighbor and the issues he caused you. We are not sure but assume he might be new in the complex as we have not had this problem before and or we were told he was not in good health and possibly was a bit out of character. That being said, we did contact the on site managers at Nihilani and they did immeidiately speak with him and voiced to him his unexceptable behavior and did give him a warning. We definitely will keep a close eye on this and follow through as needed and keep on top of it. We have not heard any complaints from the guest that checked in after you so we are hopefulthat he heeded the warning. Just to let you know, also we do represent other units in this complex and some that also are townhome models with unpstairs/downstairs in one unit, if you might have interest. Excellent 3 bed/3 bath with TONS of space. Located right across from Makai Course and short drive to lots of area shops/beaches. Highly recommend for large/multiple families. The house and community were lovely. Well equipped kitchen, really nice furniture. 3 large bedrooms. Spacious and immaculate. Brand new large screen TV. Nice community pool and hot tub. Friendly neighborhood. Not real close to beach (10-15 minute drive to Hanalei Bay or Anini Beach). Closest beach was 200 stairs down (urgh)! Easy access to golf and supermarket. And very reasonably priced for such a nice place! We so appreciate you taking the time to send in a review for the unit 24c at Nihilani. We are always happy to hear how much you loved the unit and the area. Thank you for all the complimentary things you had to say. We are glad you enjoyed your stay and hope you can come again! Very clean and spacious. Beautiful pool area. Only complaint is you need a new can opener! Everything else was wonderful. Would highly recommend and would definitely stay again! Thank you for posting a review for the unit 24c at Nihilani. We are glad that you found everything wonderful! We thank you very much for your recommendations. We follow up on the can opener to get a replacement. Thanks again for the review! Place exceeded our expectations. Well decorated and modern. Very clean and kitchen was well stocked. We made breakfast everyday for the family. Place had everything we needed to make the trek out to the beach! Chairs, snorkel gear, sand toys, coolers, you name it! It was also nice to do quick loads of laundry and not having to go out and buy detergent too. It's really the little things that matter. We definitely plan to stay here again. Thank you for your review and your kind words. We are so happy you found the condo to be more than you expected. We do try to make sure our guests have all they might need and more. It is a spacious and accommating place to spend a great vacation. We do hope you will come again! Let me first of all say that if I could have given 4.5 stars, I would have. The condo was great for our family of 6. We honestly couldn't have asked for more in terms of location and the accommodations for our family. The beds were very comfortable. The A/C was rarely needed, but when it was, it was so great to have it as well as the fans provided for every room. The beach chairs and towels were so nice to have as well. The only reason I wouldn't give this a full 5 stars is that the carpets just in the entry and then into the dining room area desperately need cleaning. It was a poor first impression as you walk in that you quickly start to overlook as your stay goes on. Other than that 5 stars. Great amenities..great location...beautiufl condo. Only issue was constant dripping noise on outside of master bedroom and one of the two grills at the pool wasn't working. We had during our 3 week travel on the Hawaiian Island various appartments - this was definitively the top one. Large, very stylish, quiet location, very well equiped (incl. the kitchen as well as with beach gears). And on the top with a welcom basket we only had in this apparment. We would return to this appartment any time and would recommend it to our friends. This was our second stay in this spacious 3-bedroom unit. I check ratings and reviews before booking a place and this one turned out even better than I expected. We have relatives who will be staying in this unit soon based on our positive experience. Thank you so much for the great review! We are glad you were well pleased with the townhome and found it very spacious. Thank you also for returning and referring us to others! Thank you so much for taking the time to post a review from your stay in Kauai. The unit 24c is very spacious and accommodating and we are glad you enjoyed the unit. We are glad that you enjoyed the area and took in all the Kauai has to offer with amazing vista, lush follage and lots of adventures. We are always happy to address any concerns our guests have and respond as quickly as we can. We are sorry to hear that the neighbor played the TV loudly. This is something that we can address with the resident manager. Thank you for letting us know. We hope that you can come back again and stay with us in your next visit. We also love to have such nice people as yourselves as our guests. We had a wonderful stay at this condo, we were a family of 3 adults and 2 children and everyone enjoyed the spacious accommodations with very nicely furnished accommodations. The actual location within Princeville was great, 5-7 minutes from Hanalei Bay (which is absolutely gorgous), supermarket just up the road is very convenient, make sure you go to the St Regis Resort l with their breathtaking views and watch the sunset. Aloha condos has a great web site and booking could not have been any easier, I will definitely choose to stay at this property again, we had a wonderful stay here. Thank you for the great review! The townhome 24c at Nihilani is a great unit, very spacious and accommodating and all at a reasonable price. Thank you for noting it was spotless as we do try very hard to keep a pleasing environment. The location in Princeville is perfect and is close to lots of activities, stores and restaurants. Thank you for choosing to stay with us and please come again soon! The condo was very nice and the king bed was very comfortable. A few complaints from the couple in the queen bed and one of the twin beds. Loved that it was within walking distant to the pool. The condo was very roomy for six of us and well stocked. We made most of nightly meals there. Loved having breakfast out on the deck. A few bugs to deal with around the stove, but not a huge deal. Overall very happy with our stay. Thank you so much for the great review! This condo is located is such a convenient location and is close to everything you need including the beach! We are happy to hear you found the condo comfortable and well equipped for your stay and would enjoy returning. We would love to have you back. Thank you for your business! The Townhome was absolutely lovely. It was large enough to comfortably accommodate 5 of us. It was clean, well equipped, and conveniently located to a variety of locations in the north. The staff of the management company was superb. When we called about something not working, we got immediate responses. They were also wonderful about accomodating our needs on checkout day. I would certainly recommend this condo to my friends. Thank you for your review! We are happy to hear you were very pleased with this townhome. It is a very spacious home and accommodating with everything one might need. We do appreciate the feedback with our services and our quick response time. We do try really hard to answer the needs of our guests and take it very seriously. It is always great to get recommendations from our guests and we do want to thank you for your kind words. We hope you can come again and stay with us! We enjoyed our recent stay in Princeville and Unit 24C met all of our needs as far as space and amenities. It was great having a bathroom connected with each bedroom. We enjoyed usage of the pool area as well. This place was amazing! Very clean and great Nieghborhood. Has a great pool area. The condo is decorated very nice and was stocked with everything we needed to have a great stay. Perfect for families! My wife, my 4 kids and I spent a week in the 24c flat. The standard of the flat were above our expectations.The flat is very spacious, furbished with a lot of taste, very well equipped and perfectly clean.The condo is very quiet, we have a direct view on the golf and are 3 minutes walking from the pool though the Tropical garden.The Condo is 5 min driving from the Foodland and restaurants (which is convenient with kids) and 10 min driving from Hanalei beach. Really enjoyed our stay at this townhome. Everything was setup up very nicely, which made the stay for my family very comfortable and enjoyable. I cannot describe the overall ambience, spaciousness, and comfort of this unit. Our stay was so relaxing and the unit has every amenity you would ever need while enjoying Kauai!! It is clean and inviting, cozy and well decorated! The kitchen is fantastic and has anything you would need to create all meals in. The washer/dryer (separate laundry room) is perfect ! The garage is stocked with Beach Chairs and ice chest and sand toys etc! Truly fully accommodated! The location in Princeville is the best and easy access to the unit was so nice. Absolutely beautiful and very well furnished. This townhome has everything you need (and didn't want to bring on the plane with you) for an easy, relaxing vacation...beach towels, beach chairs, snorkel gear, sand toys, water shoes, etc. The pictures are accurate but really underestimate the quality and spaciousness of the home. We will definitely come back to stay the next time we come to Kauai! Very spacious, clean, great layout for multiple friends or couples. Convenient location to shopping, market, beach. We preferred this unit to single family homes our friends were staying. We felt we got a newer property for the price. This was our second stay at Nihilani and definitely will stay again. Mahalo! I was only staying at the condo for 4 nights and it was so not long enough. The condo is in excellent condition and was so well stocked with everything that I could possibly need. It was so clean and so well taken care of. Im defiantly coming back to that beautiful island soon and most defiantly will plan my trip around the condo dates that are available. The condo was beautiful, spacious, well designed and furnished. I wish we had more time to spend there, but our family was in another condo in the same development and that was the central gathering place for meals, etc. I acutally could see myself living there! 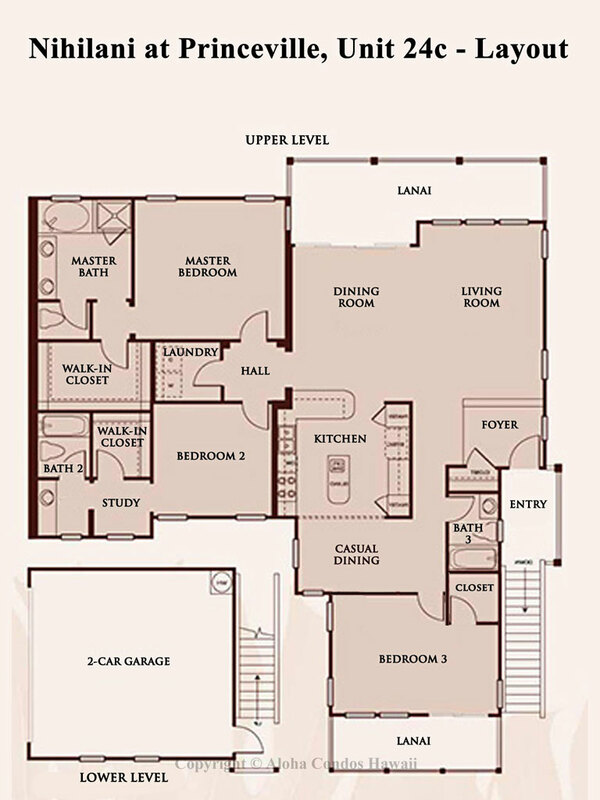 What a great floor plan. Loved having nice beach towels, chairs and umbrellas for our use. Nice having a two-car garage also.We never could get the wireless to work for us, but didn't need it enough to call about it.My only complaint would be the over abundance of signs in the complex...so many rules posted everywhere. It was kind of ridiculous. "Signs, signs, everywhere signs...blocking out the scenery, etc..." I'm all for having a nice complex and keeping things (and people) in order, but it seemed a bit excessive and intimidating.That being said, if I ever find myself back on Kauai (usually go to the Big Island), I will book the condo again. Highly recommend it! Spacious. Warm. Welcoming. Amenities. Great bang for your buck! Great location. Spacious. Warm. Welcoming. All the comforts of home plus so much more. Highly recommended and if we ever return to Princeville, this unit will be our desired unit for the value, amenities, and size. From my first contact with the staff at aloha Condos through the last day of our vacation it is hard to think of enough adjectives to adequately describe our experience. The condo is beautifully decorated yet functional with all the amenities anyone would ever need. The pictures do not do it justice and everything far exceeded our expectations. My only hesitation in writing this review is I want to keep this wonderful condo all to myself so it will be available when we are back next year. Thank you to the owners but especially to Kristen and Graeme at aloha Condos for making the entire process of renting a vacation property, sight unseen, over the internet, a great experience. This condo is so nice, clean, modern, beautifully decorated, nice quiet community, stocked with anything you would ever need. We were very happy with our stay, and if we go back to Kauai, we'll be staying there again! This was a wonderful condo that sleeps 6 very comfortably. It has everything you need for the vacation and any questions I had were answered quickly and efficiently (like late change to make the double beds into a king bed. I went with 2 other couples. I wil stay there again if I can find the time! This rental is an exceptional value. First, it is air conditioned unlike other units, notable the Bali just across the street. Unit 24C has obviously been furnished by a professional interior decorator, and it is gorgeous. There is surround sound system for all the three televisons in the unit. All the amenities for a condo are available: a kitchen, a breadkfast nook, a dinning area, dishes, utensils, and a washer and dryer. And, it is very quiet. We owned a unit is Lanikai in Honolulu and rented it on Vrbo that had private access to the ocean. The unit in Kauai, 24C, compares well even without the ocean access and is a better value. Thank you, Andy Irons! We thoroughly enjoyed our stay. The condo was well stocked with everything we needed. Arrangements were hassle free. Our family had a great time. Rate was very reasonable. Our only complaint was that the pool was closed for quite a bit of our stay. The driving instructions from the airport to the property location were were easily understood as were the condominium and grounds rules. The accomodations were well kept and first class as were the surrounding properties. The entertainment system controls took a bit of getting used to. Instruction manual would have been helpeful. I appreciate being able to check in and out without having to physically deal with an on site agent or management company. We had the best stay at this beautiful condo. The condo is so dialed, it had everything we needed. We cant wait to come back next year. We wont stay anywhere else. My family had a wonderful time at your condo. It was furnished great-good dishes, silver, and glassware. We enjoyed barbequing and the hot tub. Would recommend it to anyone. Townhome 24 C allowed us to enjoy a perfect holiday. It offers all the needed amenities, fully equipped kitchen and plenty of room to stay in when the weather is bad. We will return for sure and recommend to friends and family. Perfect for families - great location. The condo was exactly what we needed while in town for a family wedding. Everyone else stayed close by at the resort but with such a large group we needed a more economical solution. The condo is lovely and the location was ideal. I highly recommend. For three nights in late February my family rented Townhome 24c and we very extremely satisfied with our experience. I was traveling with my wife, 13 month old daughter, and mother in-law. We enjoyed the large common areas and the individual bathrooms were a huge plus. Washer & dryer accommodations came in handy and multiple kitchen supplies allowed us to cook-up a feast and enjoy dinning on the balcony nightly. The swimming pool at Nihilani was superb and somewhat quiet which made it easier on my daughter and more relaxing for my wife. We enjoyed morning jogs and leisurely evening strolls on the nearby paved paths. Waling distance to the grocery store and a quick 10 minute drive to Hanalei beach made the location perfect. Need proof we liked this place? We bought a Nihilani unit following our stay. Long time renters on the North Shore of Kauai, we decided to try Nihilani while enjoying the fantastic beaches, great hiking and world-class golf. Well laid out floor plan, excellent condition and nice pool and hot tub nearby. Outstanding service: Awake at 5:00 AM (late for a Mainland visitor)the first day, I was having trouble getting my laptop to connect to the wireless router. Not wanted to disturb anyone so early, I sent an email to Kristen requesting help. She responded immediately and was on the way with a replacement router before 8:00 AM. Enabled me to finish my work and get to Anini Beach before 10:00 AM. We had a wonderful two week stay at this property. The condo is beautifully furnished and very nicely appointed. the electronics are top notch and worked beautifully. We loved the location and the kids loved the pool.